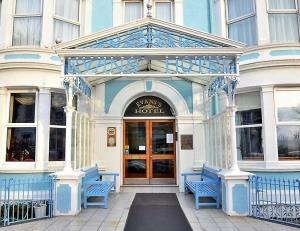 The Evans Hotel01492 860 784work HotelA warm welcome awaits you at our family run hotel. The Evans is situated on the level, in a quiet position near to the centre of Llandudno only minutes away from all the amenities of the Town and appoximately 400yards away from the Promenade. We pride ourselves in our tastefully furnished dining room, complimented by excellent food and service. Our chef provides a varied choice of menu, prepared freshly each morning. Special diets catered for by prior arrangement. All bedrooms are en-suite with either bath or shower. Each has Satellite Television, Tea and Coffee making facilities and have full central heating. There is a lift to all floors. The "E" in Evans is for Entertainment, which is both regular and varied. Please contact us for further information about our Entertainment Programme. All of our Entertainment takes place in our spacious bar areas. Alternatively, we provide quiet areas which includes 2 comfortable reception lounges. Or for the sporty, a games room with full size snooker table, pool table, dart board and skittles.